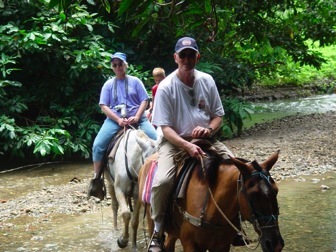 Bosque del Cabo offers horseback riding through beautiful rainforest, up wide rivers and eventually onto a gorgeous and deserted beach. This tour is led by a local Costa Rican guide named Miguel Sanchez (a colorful, authentic Osa resident) who has lived in this part of the Osa for his entire life. Miguel will take you on his tour of the Rio Piro area, pointing out flora and fauna, as well as gorgeous scenery along the way (he speaks very little English, but this has never been a problem). Sometimes he can even be convinced to show you the lagoon where several caymen live (which he can summon using an eerie call). The horses are gentle but responsive. Children and adults welcome; tour takes approximately 2 hours.